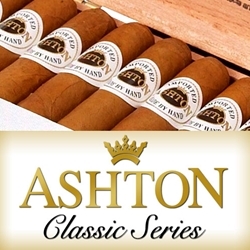 The Ashton Classic Series is the perfect choice for any smoker looking for a hand-rolled premium cigar to deliver that rich and mellow taste each time they light up one of these legendary cigar classics. Every hand rolled cigar listed below in our online cigar store offers an attractive, smooth and mild smoking experience that’s engaged to faint notes of pepper. Manufactured at the legendary Tabacalera A. Fuente factory in the Dominican Republic, Ashton Classic premium cigars are created with tobaccos that are aged from three to four years infused with binders and fillers from the Dominican and rolled up to perfection inside a golden Connecticut shade wrapper. Ashton Classics represents everything you want in a premium hand rolled cigar, character, balance, complexity and aroma. Smokers Discounts believe you'll love the Ashton Classic Series premium cigars. We’ve made it easy and affordable to buy these hand-rolled cigars online. A variety of sizes and flavors are listed below. Each of these styles are in stock and available today for a discount price. Call us for more details!